Background: In the recent years, the researches about HDAC inhibitors have become more and more extensive. 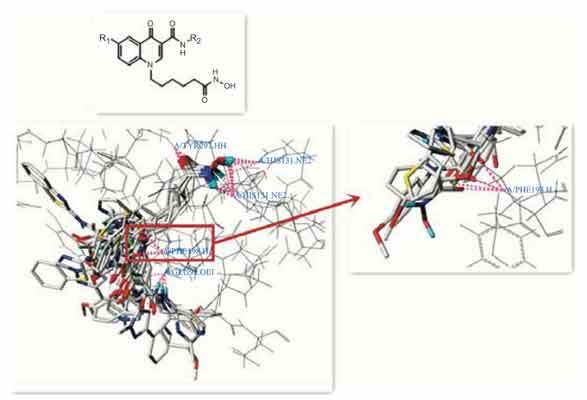 Objective: This study explored molecular docking mode and three-dimensional quantitative structureactivity relationship (3D-QSAR) of 18 novel HDAC inhibitors involving in quinolone structure. Results: The molecular docking results showed that PHE198 might be a potential active residue against 18 HDAC inhibitors. 3D-QSAR model using Topomer CoMFA possessed high predictive ability (q2, 0.637; r2, 0.966). Conclusion: Based on the results derived from molecular docking and 3D-QSAR studies, we designed several new compounds with potential inhibitory activity. We wish this study can provide some instructions for the design and structural transformation of novel potent quinolone-based HDAC inhibitors. HDAC inhibitor, quinolone-based, derivatives, 3D-QSAR, molecular docking, topomer CoMFA.